Gung Hay Fat Choy to you and yours, or in English, best wishes and congratulations. Have a prosperous and good year. The Chinese New Year is upon us, beginning the first day of the first month on the Chinese calendar and ending on the 15th day with the tradi­tional lantern festival. This year, Chinese New Year is cel­ebrated on Feb. 14, which is just enough time to invite some friends over and throw a din­ner party. While customs vary by region in China, typically Chi­nese New Year’s celebrants splurge and purchase presents, decorations, special food and clothing in honor of the occa­sion. Every family would thor­oughly clean their home, clear­ing away any ill will and mak­ing room for good luck in the year to come. Throughout China, win­dows and doorways would be adorned with red paper cutouts to celebrate the com­ing new year, reflecting themes of happiness, wealth and longevity. Many Chinese families would host a feast on the eve of Chinese New Year, serving pigs, ducks, chickens and sweet delicacies to guests. The custom of ending with loud firecrackers comes from the original practice of filling bam­boo stems with gunpowder and lighting them off to ward off evil spirits in the coming year. Early the next morning, young Chinese children typi­cally awaken their parents, extending wishes for a healthy and happy new year, and in turn are given money in small red paper envelopes. Ring in the Year of the Tiger by offering your guests a traditional Tray of Togetherness, showcasing eight (considered to be the luckiest number) special treats such as candy, dried fruits and nuts arranged attractively on a platter. 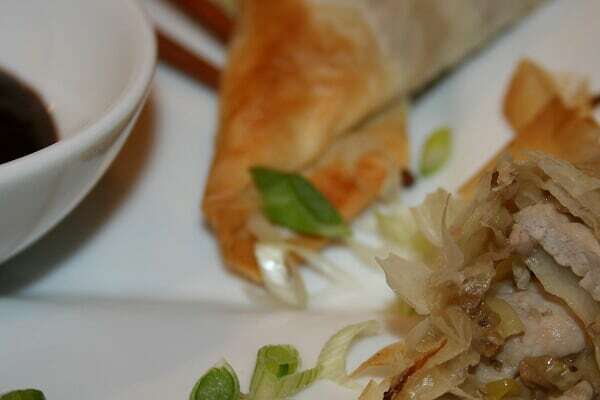 For dinner, serve Moo Shu Pork in Phyllo with Hoisin Sauce, an easy entree you can make ahead and bake at the last minute. End the festive meal with your favorite fruit sorbet, fortune cookies and firecrackers, fend­ing off bad luck in the year to come. In a large stir-fry pan or wok, heat 1 table­spoon sesame oil over medium high heat. Add pork and stir fry until cooked through. Remove cooked pork and drain on paper tow­els. sesame oil, heat until hot and add eggs. Let cook until set and scramble. Then add mush­rooms, green onions, garlic and ginger and stir fry briefly. Remove from heat. Transfer stir-fried filling to medium mixing bowl and add cabbage, rice vinegar and soy sauce. Stir to combine. Unroll one package of phyllo dough and cut into three equal stacks, each about 3 inches by 12 inches. Brush melted butter over top layer of phyl­lo. Position 3 tablespoons filling on bottom corner of one stack of phyllo, pick up the three sheets under the filling and fold bottom corner upward over the filling to the opposite edge, making a triangle (like you would fold a flag). Continue folding the triangle back and forth across the strip of phyllo until you have reached the top of the phyllo stack. Brush filled phyllo triangle with melted but­ter to seal edges and place on parchment­lined baking sheet. Repeat to fill and fold, using up filling. Bake in preheated oven for about 10 min­utes or until phyllo is evenly browned and fill­ing is hot. Serve with small dipping bowls of hoisin sauce.